Muscular Dystrophy encompasses a a group of usually inherited disorders that involve increasing muscle weakness and loss of muscle tissue over time. Duchenne muscular dystrophy (DMD) is a rapidly worsening form of the disorder that affects only males. 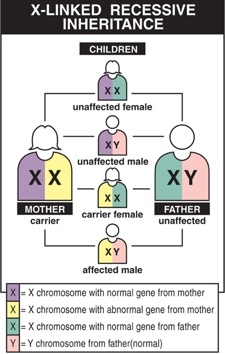 The usual cause is a defective gene carried by the mother, but about one-third of cases appear to be spontaneous mutations in the male's genes. Many mutations of the gene can cause DMD but only some common ones have been identified. Symptoms of DMD, which include fatigue, learning difficulties, muscle weakness and progressive difficulty walking, usually appear early in life around age 5. Diagnosis is primarily accomplished by DNA testing though a muscle biopsy test is sometimes required. If a pregnant woman has the genetic mutation that causes the disease, there is a 50% chance that a female child will inherit that mutation and that a male child will have DMD. Prenatal tests can determine if the fetus has one of the most common mutations that cause DMD. Many sufferers lose the ability to walk by age 12 and spend the remainder of their lives in a wheelchair. Muscular deterioration leads to breathing difficulties and heart disease. The chest and back become deformed and the muscles of the extremities gradually contract. Treatment includes respirators, drugs to assist heart function, and steroid drugs to slow the loss of muscle strength, but currently there is no known cure and death by age 25 is typical. Caring for a DMD patient involves administering medications, supervising diet, assisting with elimination, moving him from bed to wheelchair and back, dressing him, and ensuring proper use of respiratory support as the disease progresses. Medical research into DNA and drugs, physical therapy and daily patient care have improved the quality and even the duration of life for DMD sufferers. Researchers are also investigating the use of stem cell replacement and gene therapy to repair the muscular damage caused by genetic mutation. It remains to be seen if these approaches could result in a cure. This "beyond the book article" relates to The Revised Fundamentals of Caregiving. It originally ran in September 2012 and has been updated for the May 2013 paperback edition.